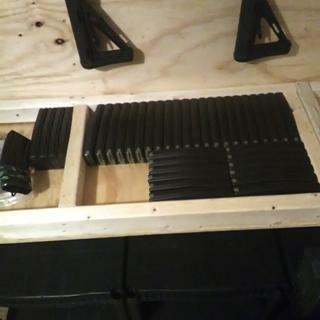 Brand new mil-spec M16/AR15 30rd aluminum mags with black teflon finish and foliage green Magpul followers. 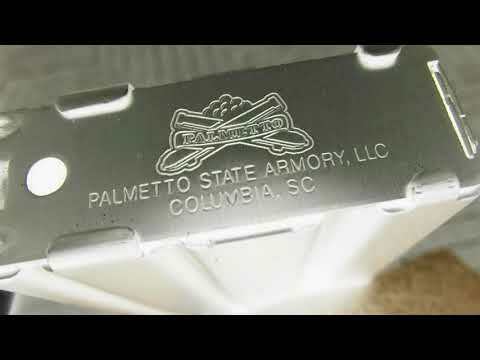 Made by D&H (Company formerly named Labelle) for Palmetto State Armory. These are the best of the breed because they have a slick durable Teflon coat inside and out. Stamped with US military cage code Q4TQ4. are there 15 round magazines ? BEST ANSWER: there sure are! just load em half way up, these can even be the rare 17 rounders... very versatile mags, i highly recommend. They are 30 round magazines. As noted in description. Some states have limited magazine capacity to 15 rounds (I think Colorado) . better comply to your masters. The government shall not be infringed! i just wondered! Thought maybe the food court ninjas figured out some math on the effectiveness of 15 instead of 30. Like the specific gravity of 30 rounds can offset the swamp cases on mars. Or some people have a hard time counting over fingers and toes. Perhaps they cant afford a 20round bit a ten round is too small.jest. These are true 30 round magazines. I do know that Hex Mag does make a 15 round AR magazine. It’s called a 15/30. It’s a 15 round magazine that mimics the size of an actual 30 round magazine. I tried putting only 15 rounds in one and my rifle exploded from disappointment. I heard that most military guys put 28 or 29 in so the mag goes in more securely, and feeds the first round better. This true? P.S. wash 30 rounds? you must mean " want " 30 rds. I don't think the mag cares what you put in. These magazines fit the Beretta Arx 100 5.56.
can you ship these to california? BEST ANSWER: Are you daft? 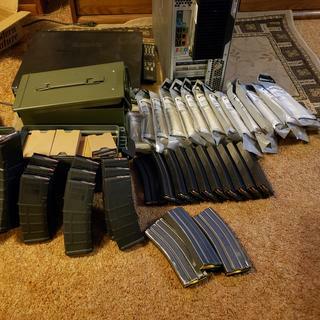 You are in California, where even thinking of owning these "super-high capacity magazines" can get you tossed in the gulag. Quick clear your mind and hope no-one ever finds your post. these are standard capacity. High capacity would be 40 rounders. Either are probably illegal in Cali. EnterHahaha, what a question, moving on to the real questions now. a reply to . 10 round is the max capacity in California, assuming you can even have these. Even before the latest law change you could own these if you owned a 458 socom as they only held 10 458's... but yeah, now federal judge ruled ban unconstitutional in California. Why YES!!! Yes you can, thanks to Judge Roger Benitez!!! California, Pennsylvania 15419 Yes. The state of, that's a negative. is this one of those notorious 30cal magazine clips ? If you think California has gulags, you have your balls in your throat. In a way they do. If you live in Pelosiville your neutered and should know it. Awww, did that hurt your little feelings? How long can you leave this magazine loaded ???? BEST ANSWER: All well designed modern magazines can be left loaded indefinitely. Springs (as do all materials) have two regions of deformation, elastic (temporary) and plastic (permanent). A properly designed magazine spring will never enter the plastic range. Leaving it loaded as designed by the manufacturer for any length of time will not cause any loss of performance of the spring, as it remains in the elastic range. I kept 10 stacked for 3 years. No issues at all. All my well designed modern mags at the ready indefinitely, over and out. It's the act of loading and unloading a spring that causes it wear. If left fully uncompressed or fully compressed it's not being used/worn. So it's "safest" to leave them empty or loaded, then they won't incur use wear. It's when you use them (shoot) or unload and reload them that actually causes wear on them thereby reducing their life. Another way this theory can be proved is automobile shocks. If you leave a car sit and sit and sit, whether on its own weight (compressed) or lifted off of its weight (uncompressed) the suspension doesn't incur use or wear. If you bought a brand new car and let it sit in storage for 30 years, 30 years later the suspension would be as good as new since it wasn't used regardless of weather it was compressed or uncompressed! It's when you actually start driving the car that they'll incur use, and every bump and pothole causes them to compress and uncompress. The more you do this, the more they incur compression/decompression use wear and will eventually need to be replaced. So, it's not until you USE a spring that it incurs wear and tear. So if you don't want it to wear out, don't "use" it! If you store it 100 years (compressed or uncompressed) then go to use it, it will still function as new, as it essentially is since it hasn't been Used! i only load 28 and once a year (even if i use or not) i empty for 48hours. Clean and reload. Never had a problem. I do steel wool feed.lips and white.lithium grease the springs. As long as you want, given a proper steel was used (and I'd bet it was), a fully loaded magazine should still be below the springs critical fatigue limit. Downloading 1 or 2 won't hurt if you want to be overly cautious. Ive heard of shooters leaving them fully loaded for up to a year. Load and store forever, I just load 28 instead of 30. I’ve had mags loaded for years with no issues. I've read about people finding WW II mags in their basements that still fire perfectly, ammo and all. Are these mags available with yellow magpul followers? Do you have these mags to fit Ruger mini 14? BEST ANSWER: No, the Mini 14 does not take AR 15 magazines. Although the magazines may look similar at first glance, the Mini 14 magazines rock into place and lock at the rear, whereas AR 15 magazines slide straight into the magazine well and have a catch located on the side. I TFB may say a Ruger mini 14 is better than an ar but it sure is not better on the wallet. Asked if they made the mag for the Mini. Not, does this mag fit the Mini. He probably knows the difference. Yes these will fit in a Mini14 the model of Mini14 that uses AR15 magazines! Its out there, buy it! Why have they stopped offering free shipping with these mags????????? Can these be shipped to Colorado? IS THIS A BANANA CLIP? BEST ANSWER: No that is a magazine not a clip. A banana clip is something that a girl wears in her hair. Or a device to which one may clip bananas, say for storage or display. No, bananas grow on trees. Banana Clip is a reference name for a hi cap mag the resembles the shape of a Banana. Not a widely used term in today’s lingo. I bought a case of these D&H mags for just in case. I have broke a couple out to see how they functioned. Flawless! Excellent value for the money IMHO. I do prefer MagPul however for everyday shooting. But like I said for the money, these mags are great. It is a 30-round aluminum magazine—tough, light weight and functions great. 5.56 magazines have a slight curve whereas 7.62x39 magazines have a much more distinct curve—is that what you mean by banana? No. Not curved to that degree. It is a 30 round magazine. It’s a 30 round magazine. Do you ship to police officers in New York? BEST ANSWER: Please refer to our Terms and Conditions page for instructions for LEO's to order "High Capacity" magazines in restricted States. what makes you so special? You can have them but others cant? Hope you use one on yourself. Follow up to PSA. Why would you ship to LEOs in states where they are banned for the average citizen? Take a lesson from Ron Barrett. I sure hope not. Police officers in New York don't deserve these. If PSA ships these to NY LEOs I would be very disappointed! Do these fit the Classic Freedom Rifle? Any AR 15 or M 16. 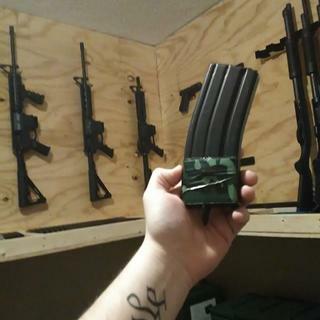 These magazines fit any AR platform rifle in the .556/223 Cal. These are the same type of magazines used currently by our military. I have bought many of these and always have had them work reliably every time. I would recommend them for anyone who needs AR-15 magazines. Yes, that is the gun Kit I use them in and never had any problems. Yes if it is a 5.56. Works flawlessly for me so far. yes they do,.......there very good magazines! yes,these are very good mags! Can this be shipped to upstate NY? BEST ANSWER: Did you try moving out of state? Did you search PSA website ? Does this item fit the PSA 16" Mid-Length 5.56 NATO 1/7 Phosphate Classic Freedom Rifle? Remember a lot of people don't live in states the allow 30 round mags. How is the weight of these compared to PMags? I heard the lips on aluminum can deform, but polymer won't. Is this true? Will these a Springfield saint ? BEST ANSWER: Yes, they will. The Saint is a standard AR, so these mags will work just fine. Will this work for 224 Valkyrie ? No. The diameter of the 224 Valkyrie is larger then that of the 556. Try using 6.8 spc mags. Those two cartridges are similar in diameter. Will they fit Colt AR-15 A2 Government Carbine? BEST ANSWER: Yes, these are mil-spec magazines. The only time I had an issue with them in any lower is a billet one I had that turned out to be out of spec. Yes, they will fit any AR-15/M-16/M4 pattern rifle. Do you have to buy these magazines by the case? Do these mags work with P80 lower receivers? BEST ANSWER: Yes, so long as the caliber is correct. Will this work on 223? BEST ANSWER: These magazines work perfectly with .223 ammo, I prefer them over the polymer mags. Yes, that is what it is for (.223/5.56). Also will work with 300 AAC. Yes, 5.56,.223 and 300blk will work get a bunch great deal. Yes. It will work for .223, 5.56 mm, and 300 Blackout. They support both 5.56 and .223 equally. Yes, it will work for both calibers. Yes, this will work with 223 ammo. Yes, their for 223 and 556 ammo. Can you run 5.56 rounds through a .223 mag? BEST ANSWER: Yes you can. There is practically no size difference between a 5.56 and a .223. Just make sure you are using the correct rounds for what your barrel is rated for. Yes, they are basically the same round. I’ve used multiple different rounds in mine and never had problems. Hope this helps. Sure can, the two rounds have functionally identical external dimmenstions. Yes, the rounds are so close in size as to make little to no difference. Yes, as far as magazines, these rounds are interchangeable. With this mag you can run 556 or 223. Yes, there is no sizing difference. I do and never have a problem. In the description it says "Follower: Magpul Foliage Green OR Yellow Anti-Tilt Follower" then later "foliage green Magpul followers", so I'm assuming these don't have anti tilt followers and they're not the yellow ones? BEST ANSWER: I got these mags recently and they are anti-tilt followers. Presumably they eliminated the color variation and neglected to amend the tilt function. Mine are anti-tilt green. I assume the yellow ones are anti-tilt also. From what I’ve seen, all the new mags have anti-tilt followers. All of mine have been anti tilt ,and I've bought a BUNCH of them.Don't think the color matters. I recieved 10 with foliage green followers and they were all anti tilt followers. All Magpul followers are anti-tilt, so green or yellow will be anti-tilt. Mine are green anti -tilt. Buy as many as you can. While you can. Both the green and yellow followers are anti tilt. Okay, thanks for your responses, brothers. What are the odds of these causing a jam? BEST ANSWER: Highly unlikely, assuming your rifle is within spec. I have over 200 of these things, only have around 20 or so in current use. I mark each mag that I start using with a paint pen, in case I need to narrow down any issues with feeding, etc. So far I haven't had to take any of those 20 out of rotation, or clean or file them or adjust them in any way. Ordered 10 mags haven't had any issues of jamming. I prefer the aluminum mags. I havent experienced any issues at all with these mags. They work fine. I have never had any problems with them, they work great. I have had no malfunctions using these magazines. I've never had a problem and I've bought plenty. How do these mags work with 300 blackout? Do the rails push on the ogive of the large subsonic rounds? BEST ANSWER: These mags work very well with my .300 blackout rifle. Better then most poly mags I have tried. Works as it should w/o issue using either super or sub 300 AAC. Works great just like any other mag like a pmag would be ! Is PSA shipping these to California now with the new court ruling? BEST ANSWER: Yes, No smuggling into occupied territories of America. Will these mags work in S & W Sport II AR? BEST ANSWER: These mags should work great in any ar. I have not had any trouble with them in any of my ar's. I have 3 American Made Tactical 80% lowers and have no problems with any of them. I have friends with other lowers that also bought these and same thing, no problems. Hope this helps. I have a s&w m&p sport ll ar 15 and i have had no issues go in with a full 30 and drop out with out an issue. Yeah they work amazing! I have the same rifle and never have ftf or fte issues. Yes they fit perfectly on mine. Just as good as any P-Mag I have. are these magazines individually packaged? BEST ANSWER: No. If you buy several they are shrink wrapped in bundles of 5 mags. Mags are not individually wrapped of packaged. Not individually packaged but wrapped in stacks. Mine were stacks of five. Are these true 30 round, long term capacity? BEST ANSWER: Definitely 30 rounders. Keeping them fully loaded for an extended period of time should not affect the spring tension. Cycling the spring by loading and unloading the magazine multiple times might cause minor spring fatigue? However I have never personally had this happen to me. Yes, they are thirty rounds, as are all of these sorts of magazines. Don’t listen to old fogeys that say to download; if the magazine doesn’t work with 30 rounds, it is faulty. Mine all hold a full 30 rounds and I'll let you know about the condition of the spring in say, 100 years? Yes they are. I have several. They work great. Great magazine, nicely made, and functions well. PSA provided a sweet deal. These work flawlessly. I like these way better then the polymer mags. Sturdy, low price, will be purchasing a lot more soon!! Been working great for me so far. These mags just run...and run...and run. Purchased probably 50 of these mags over time. No 5 star due to one mag with a curled feed lip from the stamping. It straightened up fine and just use it as a range mag. Overall excellent value and very pleased. Great product for the price! I would definitely recommend this quality to anyone. Looks nice but very brittle. Took two apart to check the follower and spring. One went fine, the second one had a very tight base plate so I had to bend the tab slightly. The tab broke as soon as pressure was applied. The magazine is useless now and I don't trust them to not break if dropped. Great product for the $. Use them for my 300AAC ammo/gun to differentiate between my 223/5.56. Recommend. These are the best cheap magazine I have found. Don't get me wrong I have lots of Magpul and Lancer mags, but these are great cheap mags to stock up on for a rainy day or to just leave loaded for when you want to shoot a lot. I keep a fat 50 ammo can with 32 of these loaded, they fit perfect upright and ready to go. Fit right in with all the others. I experienced several misfeeds with these magazines. Very disappointing. Highly recommended. Great mags, great price and quick delivery. Very sturdy, well made magazine. I am partial to metal shell mags for durability, I drop stuff. These are rugged and function flawlessly in my AR. I have cracked polymer mags simply by dropping the full mag on the floor. I don’t see that happening with these mags. The only difference in this mag and those I carried in the military is the follower is now plastic instead of die cast metal. Great mags!! Lightweight runs flawless!! These mags are the shiz, get some! Great price and seems to function well. Very well made magazine. I’ve had no problems with any of the ones I purchased. Great and low priced good product need more. Love these, they do need a little oil. After 50 rounds or so they run smoth. Load easy . Run great. Good mags for the price and function fine. This is a good mag as far as I can tell. It feels lighter than a G.I. mag but still works. If you need to buy mags in bulk, this is worth it. Buy a few and test it out. The followers are nice and don't tilt. These mags run flawlessly. For the price you couldn’t do any better! This is the best BANG for the Buck around. Works well at a great price. Springs are a bit stiff when new but they loosen up in time with use. So far has worked perfect. Fit and finish is good. Never had issue in over 1k rounds. With The PSA-15 !! Super Great !! Love them!!!! Have 100's of roynds through them so far, with NO issues. Will be buying more. These are some of the best milspec mags. I’ve used a bunch of them with various vendor logos stamped on the base plates and never have a problem with any of them. When they’re on sale at PSA you can’t beat them. Great magazines! You can't beat these for the price. Best deal out there. Shipping was a bit slow, though. I'll buy more. Mags are good quality and fair priced. For the money they are a great value! These mags are amazing. I initially bought 10 to try. I was really surprised the the $8 may was this functional. So I later bought 40 more. These have a great follower and feed reliably every time. I've melted a few magpuls but that should never happen with the aluminum body. Best value for the price. I will be buying more. And you shouldn't miss your chance. Jump on it while you still can. You won't be disappointed! I personally prefer the metal GI mags over the plastic ones. But I believe the plastic ones work very well also. I haven't used them yet, but I have many older ones I have used and they all work perfectly. And... My wallet hates PSA. Great mags at a low price. Great magazines at a low cost, I will purchase more. Shipping time was pretty fast. About a week longer than I expected. I couldn’t pass up the great deal on these mags. Just today had a chance to use these magazines, they have been fully loaded a couple weeks. Performed flawlessly in my Ruger MPR. No jams or failures to feed. I plan to buy more the price is great. Received the magazines as expected. Anti-tilt followers and aluminum GI construction is all I was looking for and they fit the bill. Loaded em up to 28 rds test fit and release is as expected. When priced right, these mags are a great buy. These are great mags. I have pmags and use these instead. No issues at all.